Thanks to all for the kind comments (and thoughts) about my dad. He was discharged from the hospital last Wednesday--earlier than expected--and is now home and doing well. Unfortunately, the damage to his heart from his most recent heart attack is irreparable, and now his treatment is focused on symptom management and close monitoring. He could live for many more years, but this is definitely a turning point, and not one that any of us are happy about. While sitting (and knitting) around at the hospital I did spend some time thinking about his diagnosis of "heart failure." Though it certainly is an apt medical description for my dad's condition, it is so wrong in every other way. My dad may have his faults, but his true "heart" has never failed; he is one of the most generous-hearted people that I know. I did not get a gold medal in the Knitting Olympics. However, I did finish the left front of the Sunrise Circle Jacket (pdf here), which is shown in the previous post in its almost-complete state. I also have the right sleeve completed up to the point where you begin the raglan shaping and the increases for the front. The pattern is very clever, and although the rows of stockinette get a little boring, the frequent increasing keeps me on my toes. The yarn is Paton's "au natural"--a blend of wool, cotton, and linen--that I bought for some ridiculously low close-out price at Webs years ago (1998?). I used one bag of it to make a really ugly cardigan on my Incredible Sweater Machine, and the second bag has been sitting around in the bottom of one of my stash bins. I may have to rip out the ugly cardigan in order to have enough yarn for the new jacket, but that is no great sacrifice on my part. 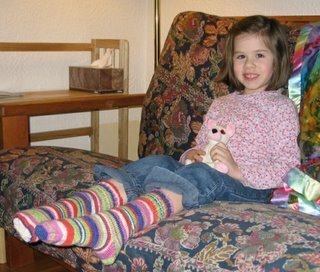 I do have two FO's to report, though: I finished some Happy Socks for my daughter. The yarn is "Magic Stripes" from Lion Brand, in the Jelly Bean colorway. The pattern is a mish-mash of basic sock patterns. And we call them "Happy Socks" because of the look on her face!